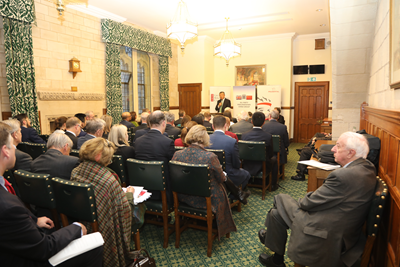 It is a great delight to be back at the House of Commons for this event co-hosted by GBCC and APPCG to talk about the 19th National Congress of the Communist Party of China. For the past weeks I have been busy sharing information with my British friends about this epoch-making Congress. I published articles on newspapers and delivered a few speeches. And I was on ITV's "Peston on Sunday". I want to get more people to know why this Congress is significant to both China and the world. I hope to elaborate on China's new thinking, new blueprint and new measures for further development. I was honoured to have attended the Congress in Beijing in person. And I feel equally honoured to be here today to share my thoughts and observations with the British Peers and Members of Parliament. Today, I am going to deliver a speech first, then we get down to further discussion. I completely agree with Sir Oliver's suggestion that I shall leave more time for questions. I know you have come with a lot. So despite of the golden rule of 70 per cent speech and 30 per cent Q&A, today I am going to turn this around by leaving 70 per cent of the time to Q&A. Please feel free to raise any question you may have. I promise I will leave no question unanswered. Now, let me begin with the core message of the Congress. This is: socialism with Chinese characteristics is entering into a new era. What does the new era mean? I think there are at least five implications. First, China is at a new historic juncture. To know where the future lies, you must first know where you are. The 19th Congress sets the direction for China's development in the coming years. After nearly four decades of reform, opening-up and rapid growth, the principal contradiction facing the Chinese society has evolved. And so has our main task. According to the Congress, China's main task now is to address the imbalances and inadequacies in our development in order to meet the people's ever-growing needs for a better life. Recognizing this change is highly significant. This will determine what policies and overall strategies China will adopt. China continues to push for development. But we will target the imbalances and inadequacies in our development. This means we want higher-quality growth and we want more efficient growth. We want to meet our people's needs for a better life in all respects. This includes economic, political, cultural, social and eco-environmental needs. We want well-rounded development for every individual and social progress in all respects. Second, in this new era, we have new theories to lead the way. Theoretical guidance is the soul of a political party. The new theoretical guidance of our Party is Xi Jinping Thought on Socialism with Chinese Characteristics for the New Era. This was established at the 19th Congress. It answers the fundamental question of how to uphold and develop socialism with Chinese characteristics in the new era. It consists of strategic plans for our work in 17 areas, including the economy, politics, rule of law, science and technology, culture, education, people's welfare, ecology, national defense, diplomacy, party building, etc. This is a new milestone in the evolution of theoretical thoughts of the Communist Party of China. Xi Jinping Thought is a system of scientific and comprehensive theory. It is the result of adapting Marxism to the Chinese context. It represents our latest efforts in theoretical exploration and creation. It is the political and ideological guarantee for building socialism with Chinese characteristics. Third, in this new era, we have set new objectives. These objectives unveil an exciting future and give us great confidence. The five years between now and the next National Congress are crucial. It is a period in which the time-frames of China's "two centenary goals" converge. The first centenary goal is complete the building of a moderately prosperous society. This will have been delivered by 2020 before the 100th anniversary of the Communist Party of China. Then it will be time to move on to the second centenary goal of building a modern socialist country when the People's Republic marks its 100th anniversary. This new blueprint marks out the important signposts for our journey ahead. It demonstrates the Chinese people's strong confidence in their country's future development. Fourth, in the new era, we have made new action plans. Big accomplishments always require overall planning. The 19th Congress has made overall plans for China in line with the "five-sphere integrated plan" and the "four-pronged comprehensive strategy". These are new and comprehensive plans. They cover the economic, political, cultural, social, and eco-environmental fields as well as party building. China will carry out deeper and more comprehensive reforms to modernize its governance system and capability. China will implement the new development concepts and aim at sustainable and healthy growth. This will be achieved by building a modern economy and improving the quality and efficiency of growth. China will pursue a rural vitalization strategy, implement a coordinated regional development strategy and carry out the Healthy China initiative. China will take tough steps to forestall and defuse major risks, carry out targeted poverty alleviation, and prevent and control pollution. And I want to stress that China will stay open to the world. We will only open wider. Here, the Belt and Road will be a priority. In developing this major initiative, we will strive for shared growth through discussion and collaboration with partners. And we will open wider to the world in building up our innovation capacity. With these efforts, we hope to break new ground in opening China further through links in all directions, across land and over sea. Fifth, in the new era, we have a new central leadership. A great cause calls for strong and firm leadership. The 19th Congress elected a new CPC central leadership. The new Central Committee and Political Bureau are strong and vigorous with political integrity and professional competence. This goes to show the CPC's strong vitality and cohesion. This also goes to show that China's causes are booming. The CPC will continue to work hard to secure a sweeping victory in the fight against corruption. As the saying goes, it takes a good blacksmith to make good steel. Anti-corruption is key to ensuring strict Party self-governance. Now the 1.3 billion Chinese people are rallying around the new central leadership with General Secretary Xi Jinping at its core. I have every confidence that China is in good hands, and we are well on our way to achieve the Chinese dream of national rejuvenation. I noted that many people here in Britain, the media in particular, are following China's foreign policy closely to understand how it will unfold in the new era. Some media reports are fairly objective and positive while others are based on misperceptions. Let me use this opportunity to share my take. What is China's vision of the world? How will China seek to shape the world? China envisions a new type of international relationship, which has three salient features, namely, mutual respect, fairness and justice, and win-win cooperation. These three elements are inter-connected and mutually-reinforcing. Together they give us a complete picture of the new type of international relations. Let me go through them one by one. First, mutual respect. This is the basis for the new type of international relations. The world today is undergoing major developments, transformation, and adjustment. In this context, all countries should follow the trend of the times, which is peace and development. Therefore countries must respect each other's independent right to choose their own social system and development path. Countries must respect each other's core interests and major concerns. And countries should try to learn from each other in order to stimulate progress and common development. Second, fairness and justice. This is the norm of the new type of international relations. China attaches fundamental importance to fairness, justice, rule of law and order. We believe that all countries are equal regardless of size. We always take position on an issue based on its own merits. We resolutely reject the cold-war mentality and call on all countries to do the same. We stand for a new thinking on common, comprehensive, cooperative, and sustainable security. Third, win-win cooperation. This is the objective of the new type of international relations. The ideas of "zero-sum game" or "winner takes it all" are outdated and should be abandoned. They should be replaced with a new way of thinking, namely, making the pie bigger so that everyone gets a larger share. Cooperation should aim at mutual benefits. Our world is an integrated and interconnected world. That is the right way to approach state-to-state relations. Countries certainly must uphold their own national interests. But they should not lose sight of the common interests of humanity. After all, despite differences in social system, development path and cultural heritage, we have only one world to share and we should share it in peace and harmony. Now let me turn to China's other vision, namely, building a community of shared future for mankind. This concept is about building an open, inclusive, clean, and beautiful world that enjoys lasting peace, universal security and common prosperity. In the political dimension, the community of shared future advocates mutual respect and consultation on an equal footing. It calls for a new approach to state-to-state relations based on communication rather than confrontation, partnership rather than alliance. In the security dimension, the community of shared future advocates settling disputes through dialogue, resolving differences through discussion, and joint response to traditional and non-traditional threats. In the economic dimension, the community of shared future advocates trade and investment liberalization and facilitation, and economic globalization that is more open, inclusive and balanced and whose benefits are shared by all. In short, we are all in the same boat. In the cultural dimension, the community of shared future advocates respect for cultural diversity, mutual learning and inclusive development. In the ecological dimension, the community of shared future advocates the idea of a home for all. This calls on countries to build an environment-friendly society and work with each other to tackle climate change. The world is moving on. China is also making progress. When you try to understand China's development prospects in the new era, it is important to take a comprehensive and objective perspective. First, it is important to see the complete picture. The development plans laid out at the 19th Congress form an integral whole. So is Xi Jinping Thought. It is a system of scientific and comprehensive theory. The new ideas and strategic plans are interconnected rather than isolated. They are part of a systematic structure, not just individual bits and pieces. They should always be seen and understood as part of a complete picture. If one only focuses on the bits and pieces, it is easy to loose sight of the larger picture and the overall trend. As we say in China, "Staring at one tree will make one blind to the whole forest". My second advice is that it is important to see China in the long run. China has its share of challenges. There are imbalances and inadequacies in our development. There are also problems of one sort or another with our investment environment. During forty years of reform and opening-up, China encountered and overcame countless difficulties. Our experience speaks loud and clear: When you run into a problem in the process of development, development itself is the solution. According to the Chinese philosophy, in every crisis there is opportunity if you are ready to see beyond the problems before your eyes. If you can not, and if you hesitate and dare not take action, the many "golden opportunities" will slip away. My third advice is that it is important to keep our mind open and updated. There is one most important experience in building socialism with Chinese characteristics for the new era. That is, we have found our own development path, and this path suits us. This is a path of constant reform and innovation. On this path, we must always keep pace with the times. Going forward, China will keep on innovating. China will keep on reforming. China will keep on developing. When interpreting China's path and China's development, one should abandon the cold-war mentality and do away with the old-fashioned logic of power politics and zero-sum game. Those who cling on to these outdated concepts will end up on the wrong side of history. 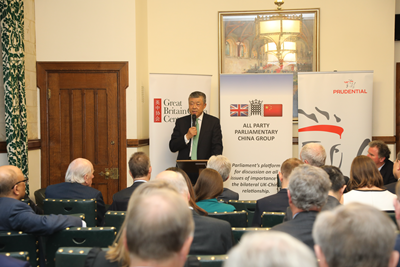 This year marks the 45th anniversary of China-UK ambassadorial diplomatic relations. It is also a year for consolidating the China-UK Golden Era. We have every reason to be proud of the progress we have made in our bilateral ties, and we have more reason to feel heartened by the prospects of our future relations. 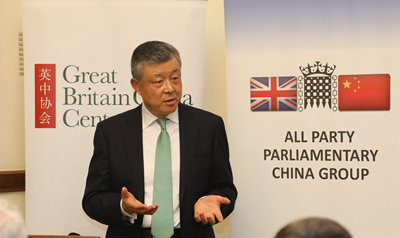 For China-UK ties, I believe the 19th Congress brings at least three major opportunities. The first opportunity comes from China's development policies. China will pursue innovative, coordinated, green and open development shared by all. These are what we call new development concepts. We will stay open. And we will build a country of innovators. To achieve this, we will implement the system of pre-establishment national treatment plus a negative list across the board. This will significantly increase market access, further open up the service sector, and protect the legitimate rights and interests of foreign investors. An example of this is the recent measure to increase foreign ownership limit in the financial sector to 51%, with the prospect of removing the cap after three years. I believe the British business community will welcome this new move. Going forward, China will roll out more measures that focus on improving lives of the people and stimulating growth. These new favourable policies will create more opportunities for closer cooperation between China and the world, Britain included. Second, there are opportunities in China's booming development. China is the world's second largest economy. We are on average contributing more than 30% to world growth. As China continues to grow and opens further to the world, its role as an economic powerhouse will be reinforced. A prosperous China is delivering benefits to world peace and development. A stronger China will certainly make greater contribution. In the coming fifteen years, China will import 24 trillion US dollars of goods, open up a 2000-billion-dollar market to foreign investors, and invest about 2000 billion dollars overseas. In the next five years, Chinese tourists will make more than 700 million overseas visits. These numbers offer a glimpse of what kind of opportunity China will bring to the world. Third, there are opportunities for international collaboration. At the 19th Congress, China highlighted its concepts of global governance. These are extensive consultation, joint contribution and shared benefits. In line with these concepts, China will work vigorously to advance economic globalization and play an active part in building and reforming the global governance system. China and Britain are both permanent members of the UN Security Council and important members of the G20. Our two countries have broad consensus in upholding free trade, supporting economic globalization and improving global economic governance. And our cooperation in these areas has been effective. "I am committed to maintaining the Golden Era of our relationship with China...whose decisions together with ours will shape the world around us." I think the Prime Minister's message is loud and clean. I believe China and the UK working together will contribute undoubtedly and enormously to the building of a new type of international relations and a community of shared future for mankind. "Parliamentarians are the cream of a society. I hope you will, as we Chinese often say, 'scale higher to see further'. I hope that you will continue to promote the UK's relations with China, strengthen our friendship and support our cooperation. And I hope that you will build a bridge of understanding and cooperation so as to help create an even brighter and more promising future of our bilateral ties." Now, China's development has entered a new era. 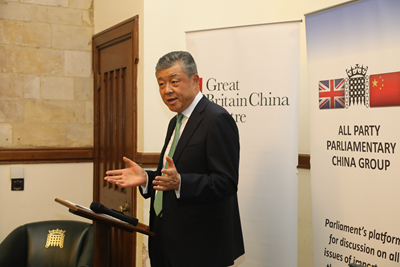 China-UK relationship is in the "Golden Era". We are ready to join hands with each and every one of you present today and with British friends from all sectors to build a lasting China-UK "Golden Era" that will bear more "golden fruits" and deliver more benefits to the people of our two countries and beyond.